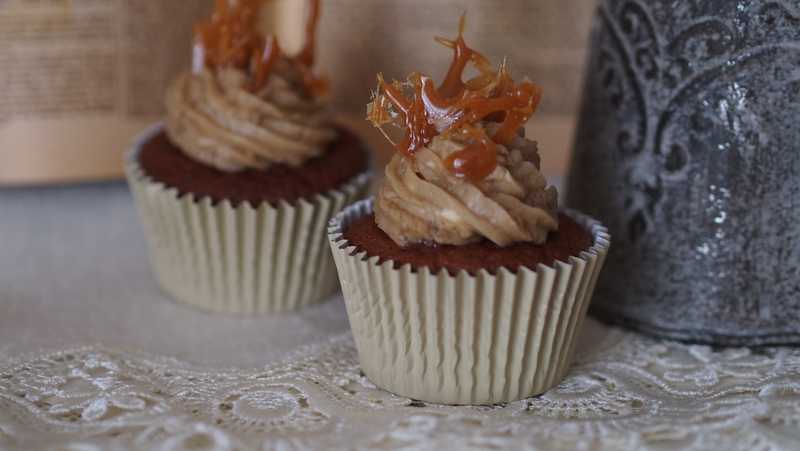 Mimi’s Name Day Surprise: Salted Caramel Cupcakes | When Judit bakes...bread and better.. I am passionate about unusual flavours that do not match as they create weird and wonderful results, giving new dimensions to known favourites. In general, when foods are grouped we have savoury and sweet – opposites. Opposites though? Are they? This cupcake reminds me of my gorgeous teenage niece: Mimi is a “bipolar-mooded” human materialization of sweet and savoury flavours, everything about her turns out to be apocalyptic and dramatic. She can turn from mess to happiness – and visa versa – in a matter of seconds, she is sometimes loud and jolly, sometimes melancholic, she is a cheeky, beautiful woman and a naughty child, all at once. 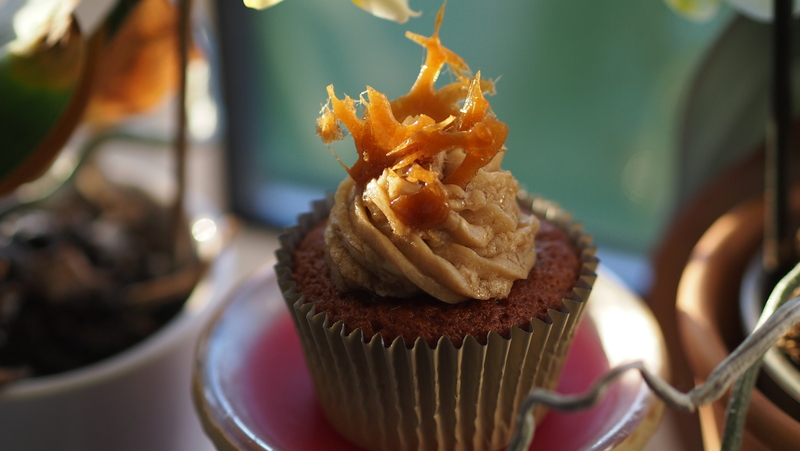 The uneven swirls of salted caramel on the top of these cupcakes take me right in front of the stage when Mimi dances…free, wild, playful and breathtaking, giving a new meaning to movements. 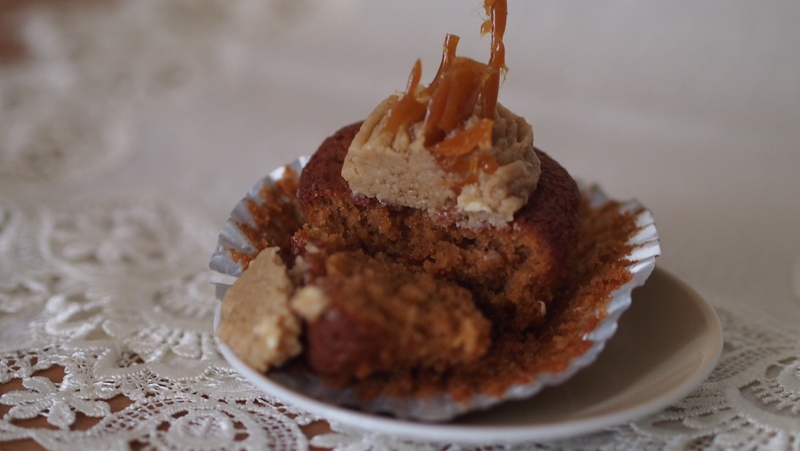 Just like these cupcakes, Mimi is salt and sugar, melted into perfection. Preheat oven to 180C degrees. Line 12-cup muffin pan with paper liners. Set aside. In a large bowl, whisk together the flour, baking powder, and salt. In a separate medium bowl, beat the butter and sugars together at medium-high speed until light and fluffy, 2-3 minutes. Add the eggs and vanilla. Beat until combined. Slowly mix in the dry ingredients until no flour remains, scraping down the sides of the bowl as needed. Slowly stir in the milk. Do not over-mix the batter. Fill each cupcake liner about 2/3 full, dividing the batter between all 12. Bake cupcakes for 20-22 minutes, or until a toothpick inserted in the center of the cupcake comes out clean. Let the cupcakes cool before frosting, about 1 hour. While the cupcakes are cooling, melt the butter in a small saucepan. Once melted, add brown sugar and heavy cream. Stir constantly over medium heat until sugar is dissolved. Add salt. Allow to cook for 3 full minutes, no more. Remove from heat and allow to cool to room temperature, about 30 minutes. With a hand mixer at medium speed, beat in powdered sugar, 100 g at a time, until desired consistency is reached. 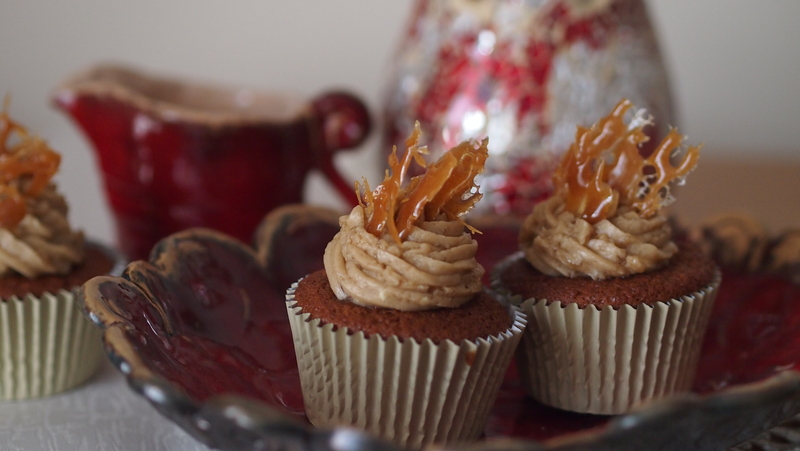 Frost cooled cupcakes and adorn with salted caramel . Put the sugar and water into a medium saucepan. Stir together over a medium-high heat, just until the sugar dissolves. Do not stir at this point. Tilt and swirl the pan while the mixture boils. It starts to caramelize on the edges of the pan, keep gently moving until it has all reached a yellowish-golden colour. Take it off the heat immediately. Add in the butter and mix it in, finally add cream, vanilla and salt and mix. Mould as desired. 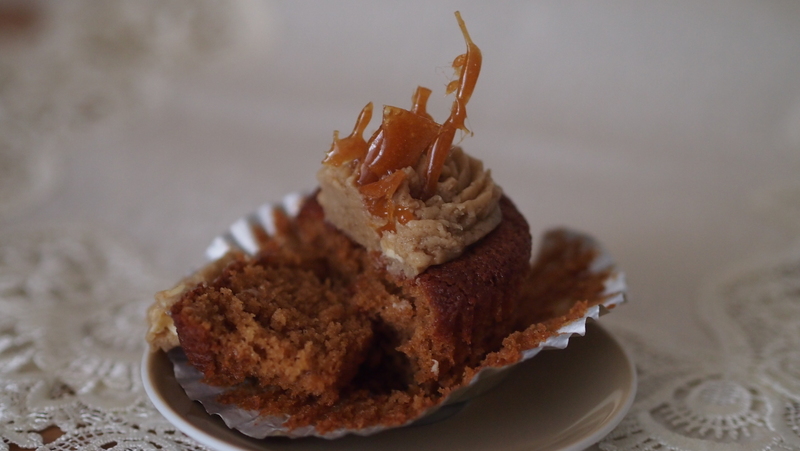 This entry was posted in Baked treats, Cakes, Cupcakes and tagged caramel frosting, dessert, food. Bookmark the permalink.